Use a good size pot – 5 to 7 gal. 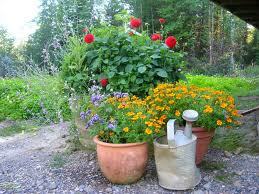 for larger plants and any size pot for the smaller dahlias like Mignon Singles which are very small plants. These little plants are wonderful in a mixed arrangement as the center plant. Use a strong tomato cage for larger plants so they will not break in the wind. Dahlias are heavy feeders so I provide some organic fertilizer and bone meal to start, mixing it just below the roots. Fish or seaweed fertilizer is good for additional micro nutrients. Once the plants get growing I add some 20/20/20 (usually liquid). In July I start to use 8/24/16 for the beautiful blooms. 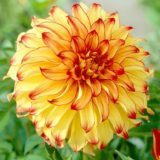 Integrity Sales provides this fertilizer specially made for dahlias. 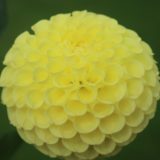 As long as there is a higher center number it will help the blooms. I use granular and liquid at different times. The liquid fertilizer can be diluted and sprayed on the plant following manufacturers instructions. Instead of following the above you can purchase slow release fertilizer and use that. The one I use for gift plants is 14-14-14. I also suggest adding a bit of fertilizer throughout the summer with the higher center number for blooms. Put some Safer’s slug bait in and around the pot to protect from slugs. Later in the season (mid July) remove bottom leaves to improve air circulation. If you see any mildew on leaves carefully remove those leaves immediately and wash before touching plants. If you do get mildew you can check the internet for natural ways to handle it. Periodic foliar feeding helps as a preventative. Plants that get mildew are often stressed so check to see your plant is receiving the right amount of water and food. We use metal st akes for tying our plants. You can add a stake of any kind to your pot. We put a two pot upside down on top of the stake. Inside the pot we put a loosely folded napkin. Use the top of the stake to hold the napkin in the pot. Earwigs go into the napkin in the early morning and remain there until dusk. They usually attack plants after the first month when the foliage is getting larger and buds starting. Put some water and a bit of dish soap into a bucket. Carefully remove pots from stakes and napkins from pots and shake out over the soapy water. Earwigs will drown and you will have earwig free blooms to enjoy indoors.